How Does a Limited Liability Company (LLC) Pay Taxes? How Does a Limited Liability Company Pay Income Tax? A limited liability company (LLC) is a form of business organization recognized by all states. Forming an LLC provides limited liability protection for owners, who are taxed at their personal tax rates. A limited liability company is not a taxing entity, and it is not recognized by the Internal Revenue Service for tax purposes. So how does an LLC pay income tax? The IRS says that an LLC may be taxed as a partnership or a corporation (for a multiple-member LLC), or be disregarded as an entity separate from its owner (for a single-member LLC). 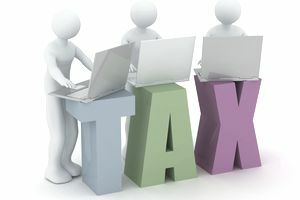 How a limited liability company pays income tax depends on whether the LLC has one member or more than one member, and whether the LLC elects to be treated as a different business form for tax purposes. A single member LLC is taxed as a sole proprietorship. That is, the information about the LLC's income and expenses, and its net income is prepared using Schedule C. The net income from the Schedule C is brought over to Line 12 of the owner's personal tax return (Form 1040 or other). A single-member LLC is considered a disregarded entity for income tax purposes. That is, the LLC and the owner are separate entities. This is the normal designation for a single-member LLC. An LLC which has more than one member typically pays income tax as a partnership. The partnership itself does not pay taxes directly to the IRS; the individual partners pay tax based on their share of ownership in the partnership. The partnership files an information return with the IRS on Form 1065. Then a Schedule K-1 is prepared for each partner, showing the share of the profit/loss of the partnership. The K-1 is filed with the partner's individual return and the gain/loss is shown on the partner's Form 1040. An LLC may elect to be classified as a corporation or S corporation for tax purposes. Usually, this election is made because it is to the advantage of the business because of both lower taxes for high-income individuals. The election is submitted through IRS Form 8832 - Entity Classification Election. The LLC then pays income tax based on this new tax status, including state income tax. The LLC continues to operate as an LLC, following the company's operating agreement. How the LLC members are taxed will change with this new tax designation. Unless the LLC decides to be taxed as a corporation, the LLC is considered a pass-through business. That is, the taxes of the business are passed through to the owners (members), to be included on the individual income tax return. The percentage of net income for the LLC is divided among the members according to their share, as determined by the operating agreement. For example, consider an LLC with two owners who share equally in the business, and with a net income of $50,000. Each owner would pay tax on $25,000 of net income. The income or loss from the LLC is considered along with other income of the owner (and spouse, if applicable) for the purpose of determining the total tax liability of the owner. Any profit from the LLC is used to determine the owner's self-employment tax liability; if the LLC has no profit, no self-employment tax is owed for that year. Each state has a different way of classifying LLC's for state income tax purposes. Most states use the federal (IRS) classification, but they usually modify the tax rate or charge a flat rate. Read more about how states tax LLC's.